George plays trumpet and percussion, and joined QUO in September 2013. 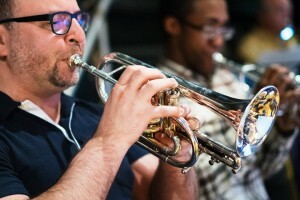 I have been a trumpet and percussion sub with QUO for the last 2 1/2 years, after moving to NYC about 3 years ago. I found out about the orchestra when I was still living in Philadelphia, and looked forward to joining the ensemble once I moved. When I arrived in NY, I quickly put my name on the wait list. My first chance to play with QUO was at the second run of The Firebird with Ballez dance company when I filled in for Andrew Berman on percussion. I was instantly hooked, and was determined to pester Nolan Dresden any chance I could to help out whenever he needed extra players. Luckily, I have been able to play pretty consistently on either instrument, and look forward to many more opportunities to perform with this wonderful group of musicians. Being fairly new to the city myself, I always like exploring new things with visiting friends and family. Visiting trips usually revolve around food (The Meatball Shop) and alcohol (really… any bar). One musical symbol that best describes me is VS (volti subito). Sometimes found at the bottom of the page, it means to turn the page quickly. I am typically very active in many different activities and always moving quickly, while looking forward to what is coming up next. How long have you been playing trumpet and percussion? I have been playing trumpet since 4th grade (29 years ago) and started playing percussion 10 years ago. Percussion came out of a necessity in an ensemble I was playing in (with my twin brother as the conductor) that had more than enough trumpet players, but always struggled to find percussionists. My brother encouraged me to help out on percussion and got me set up with technique and equipment. I enjoyed the completely different perspective of playing as a percussionist, and continued to play percussion in that ensemble and a few other groups as well. Question from Christina: There are so many percussion instruments in our orchestra – How do you decide who will play which instrument in your section? Does everyone know each instrument, or does each member only focus on a few of them? Typically the percussion section leader of the ensemble will assign parts, either knowing or asking the players if they have a preference. Most percussionists can play every instrument, but have preferences or strengths for a particular group or style of instrument (mallet/keyboard, snare, timpani, etc.). As percussionists, even though we play within a section, we are soloists on our individual instruments. This is part of the charm and enjoyment I find with playing percussion. Even when we may only have a few notes in a piece, playing those few moments on crash cymbals, for example, can be the defining and most dramatic part of the music.